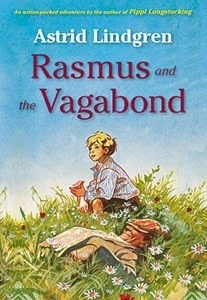 "Rasmus and the Vagabond" is a novel by Astrid Lindgren -- the Swedish author of the beloved Pippi Longstocking books. Rasmus is a young boy living at an orphanage who is longing to be loved. When a mishap at the orphanage causes Rasmus to fear he'll get a beating from the stern directress, he makes the decision to run away in search of a family who will love him. I really enjoyed the part of this novel that described Rasmus' life at the orphanage -- the relationships between the kids, the chores they are required to do and the adoption process: "They always pick girls with curly hair". The highlights of Rasmus' experience at the orphanage are his friendship with another orphan, Gunnar, and his finding special treasures -- a 5 cent piece and a beautiful shell. Eventually, Rasmus meets up with Oscar, a traveling vagabond, and together they have adventures, help others and solve a mystery. My biggest concern with the novel is the songs that Oscar sings. The lyrics feature stories about people being cut, clawed to death by lions or bathed in their own blood. Mention is also made about a ghost dog, but the book clearly states "There are no such things as ghosts." Aside from the songs, this novel is a fun, lighthearted novel complete with adventure and mystery. The illustrations are delightful and Rasmus is such a sweet boy that readers are sure to fall in love with him and with Oscar, the kind vagabond he meets on his journey. Will Rasmus' dream of finding a home of his own and a family to love him come true? You'll have to read "Rasmus and the Vagabond" to find out! Check out: "Rasmus and the Vagabond" for more information. Win it: One Sowing Dandelion Seeds reader will win a copy of the book "Rasmus and the Vagabond". One of my greatest treasures is a restored relationship with my mom. That is so beautiful, Soo. I loved the Pippi Longstocking books (and the movies!) growing up. I found an awesome rock once and $5 at Wendy's. kristiedonelson(at)gmail(dot)com Thank you. I would love to read some Pippi! kristiedonelson(at)gmail(dot)com Thank you. I once found a $20 Applebees gift card in a box of papers that someone had trashed at an auction. I actually sold it on eBay since I really needed money at the time to pay some bills! Oh...wanted to add...I ABSOLUTELY loved Pippi Longstocking as a little girl! I so wanted to be her! How amazing to find the same amount of money you had just spent! I've read the Pippi Longstocking books so many times...was a big fan as a kid! I haven't heard of this one but it sounds great! I just looked via Google and see that she writes many others as well--I didn't know! I didn't know until recently either! But, I loved Pippi growing up and even braided my hair on wires to be her for a costume birthday party! My greatest treasure in life was meeting my husband who gave me our three beautiful children! Sappy, true...but nothing else compares throughout my life. Awww Maureen -- that's not sappy! That's sweet! I treasured the Pippi Longstocking book series when I was a little girl. I am now enjoying it all again with my three children. After my grandma passed away, my mom gave me some cookbooks that had belonged to her. I found a recipe handwritten by grandma in one of the cookbooks. If we ever remodel our kitchen, or rebuild, I'd like to frame it. Julie, that is beautiful! But, why wait -- you should frame the recipe from your grandma right now! (or at least photocopy it and tape the photocopy on the inside of one of your cupboard doors until you can frame it!). The greatest treasures I have found are my dogs. They are so precious to me. I have always wanted to read Pippi Longstocking but have never gotten around to getting it to read and never read it as a kid. I will definitely be moving it to the top of my reading list. The best treasure my husband and I found is an advertisement online for a special needs rescue dog. We brought him home that night and he is the biggest sweetheart and absolute love of our lives now! My favorite book by Lindgren is definitely Pippi Longstocking! Such a wonderful and entertaining story! A treasure I found is my lifelong love of books and reading. What a great treasure, Nancy!